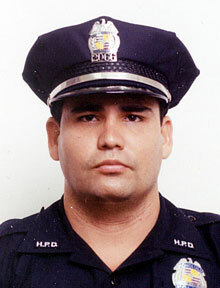 Paul Eguires, shown at the Blood Bank of Hawaii clinic on Dillingham Boulevard, yesterday responded to the call for blood donations to help injured HPD officer Steve Favela, below. Eguires held a squeezy used during the donation process. PUPUKEA resident Paul Eguires left the North Shore early yesterday morning, drove nearly 40 miles to Honolulu and waited in line for about an hour to get poked by a needle for five minutes. Then he went back home. 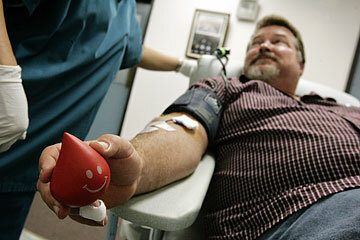 The 41-year-old was among scores of isle residents who reserved some time on a clear, sunny Saturday to donate blood. Throughout the day, Blood Bank centers that are often empty during holidays got a boost from people wanting to help Honolulu police officer Steve Favela, 30, who was critically injured last week in a motorcycle crash while escorting President Bush. Favela, the father of four young children, remained in critical condition yesterday at the Queen's Medical Center, police said. "I used to donate, then I stopped, but the police officer was a good reason to come back," Eguires said as he reclined with a needle in his arm on one of 10 chairs at the Blood Bank of Hawaii. All the chairs were full. Roselani Potts, whose 0-positive blood matches that of Favela, said she was touched after watching the officer's wife, Barbara, make an emotional plea for donations on the previous night's newscast. "I felt so bad for him," said Potts, 43, a Kailua Elementary School employee who last gave blood a year ago. "It's a great feeling (to donate), especially since he has four young kids. It's so tragic what he is going through." From 6:30 a.m. to 2:30 p.m. yesterday, when donation centers closed, 230 pints of blood had been collected, said Stephanie Rosso, communications director for the Blood Bank of Hawaii, which sets a goal of 200 pints a day but usually gets much less on holidays. She said 139 people -- including many Honolulu Police Department officers -- visited the bank's Dillingham Boulevard location, compared with an average of about 80 donors who come on a regular Saturday. "We are seeing a lot of people walking in," Rosso said. "And because we have this outpouring of support, we have more people than normal and we are running at full staff." While statistics show that 60 percent of the population will need blood some day, only 2 percent of Hawaii residents are regular blood donors, she said. "I don't want people to think that it's because of a lack of aloha," she said, saying that the state has no problem meeting its blood needs. "I think there's an anxiety of not knowing what it's like, but once they come, and they've been through it and realize it's no big deal, they'll come back." However, Rosso said that many islanders who show up to donate are unfortunately turned back because they don't meet simple medical requirements like body weight. Also yesterday, about 50 people visited a mobile blood drive between 7 a.m. and 1 p.m. at Kalihi-Waena Elementary School, said Silayan Casino, a field representative for the blood bank. Despite having made other plans for the extended Thanksgiving weekend, Sumi Matsushima, a 67-year-old Mililani resident, was one of the donors who left the school with a bandage wrapped around her arm. "I was going to go shopping, but my son told me I had to come donate," she said. "Now I have to rest."